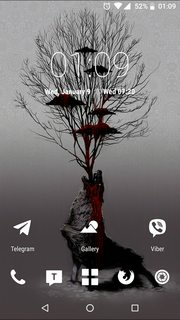 Stock Android running Nova Launcher and Whicons, and using it as a hotspot for my laptop. The wall is an aerial shot of the River Thames. Also, nice to see that the Lineage developers agree with me about which shell is best for interactive use. -edit- I love how you see things in a screenshot that you miss looking at the actual device. I've removed the page-indicator circle and set the clock widget with a little transparency (no scrot needed). I got a new phone 2 months ago (Xperia XA2). I don't like having no physical buttons on a phone, but I guess that's the trend. This phone has a LCD display; my first and only smartphone before that (Galaxy Expres i8730) which I used for 5.5 years had an OLED display. Now that I have a direct comparison: I'll never buy a phone with LCD screen again. OLED is infinitely superior technology. Even "physical" buttons in various gadgets are sensitive and feather light nowadays, impossible to not touch by accident and almost impossible to press in purpose. ^I'll have to check those icons out, nice shot!